Across the United States, building codes are (slowly) changing to encourage the construction of tighter homes. That is, homes that incorporate new materials, designs and construction techniques that drastically limit the amount of naturally occurring airflow between indoor living areas and outdoors. The rationale? Reducing the amount of air that leaks into and out of a home also reduces the amount of energy required to maintain a comfortable temperature for its inhabitants. In other words, a well-sealed home will tend to be more energy efficient (to heat and cool) than a drafty one. This is accomplished in new construction by creating an air-tight “shell” around the entire exterior surface of the home. One consideration in constructing homes designed to keep as much conditioned air inside as possible is that inevitably, over time, the quality of the air deteriorates. This occurs naturally as inhabitants breathe air in and out and artificially as exhaust gases are released into the interior environment from electronic appliances such as refrigerators, computers and televisions. According to the Maine Indoor Air Quality Council (MIAQC), Maine residents are exposed to varying levels of both man-made and naturally occurring contaminants such as radon, carbon monoxide, lead, asbestos, mercury, tobacco products, chemicals, pesticides and potentially toxic ingredients used to manufacture furniture, carpet, upholstery and some building materials. Poor indoor air quality can also be a result of bad home design, improper construction techniques and even the actions of homeowners themselves. Ill-planned renovations, over-used humidifiers, insufficiently ventilated bathrooms and kitchens, and/or neglected household cleaning, sanitizing and personal hygiene can all compromise the air inside a home. With no way out of a tightly-built home, potentially contaminated air presents a real hazard. In the past, generations of home builders succumbed to the notion that homes needed to “breathe” in order to remain structurally sound over time. In truth, this practice wasn’t as much about maintaining good indoor air quality as it was about keeping any moisture—generated internally or externally—from building up in any one place and causing the wood structure to rot. While the basic principle—flush out the old, stale, moisture-filled air trapped inside a home with new, clean drier air from outside—remains valid, building material, HVAC equipment and measurement advances over the last 10-20 years are enabling homes to better defend themselves (and their occupants) against the variable, ever-changing temperature and weather conditions outside. In a way, today’s tightly built, well insulated, energy efficient homes still breathe…they just do so more intelligently, with less waste. Indoor air quality problems can arise when changes are made in one area and consideration is not given to how that change might affect other areas of the home. In the same way that you wouldn’t want to build a large addition to your home without also increasing the capacity or capabilities of the existing heating and cooling system, air-sealing a home without considering how, where and when fresh air will enter is a recipe for disaster. To achieve a workable balance between heat loss, energy efficiency and human health, building pros are increasingly becoming big fans of mechanical ventilation—using powered equipment to recycle and replenish the air inside a home. Some Mainers are choosing to create indoor living spaces with an abundant supply of fresh, clean and comfortable air through the installation of energy recovery ventilation (ERV) and/or heat recovery ventilation (HRV) systems. As the warm air exits the home, it passes through a piece of equipment that allows that warm air to first transfer some of its heat energy to the incoming, cooler air. It accomplishes this transfer without mixing the contents of either airstream. Whereas an HRV system can only recover heat, ERVs can recover both heat energy and a small amount of moisture from the exhaust air. Konstantino explains that by not drawing in outdoor humidity throughout the summer, that ERV systems can also help homes from becoming too humid, thus inhibiting mold growth. Runs silent. Helps you sleep, deep. The technology used in whole-house ventilation systems is not new. Throughout Europe, manufacturers such as Zehnder, Panasonic, Lunos, Venmar and Honeywell have been developing and installing energy recovery ventilation systems for decades. Here in the U.S., homeowners will immediately benefit from the continuous improvements these and other manufacturers have made in system design, filtration, energy efficiency and noise reduction. 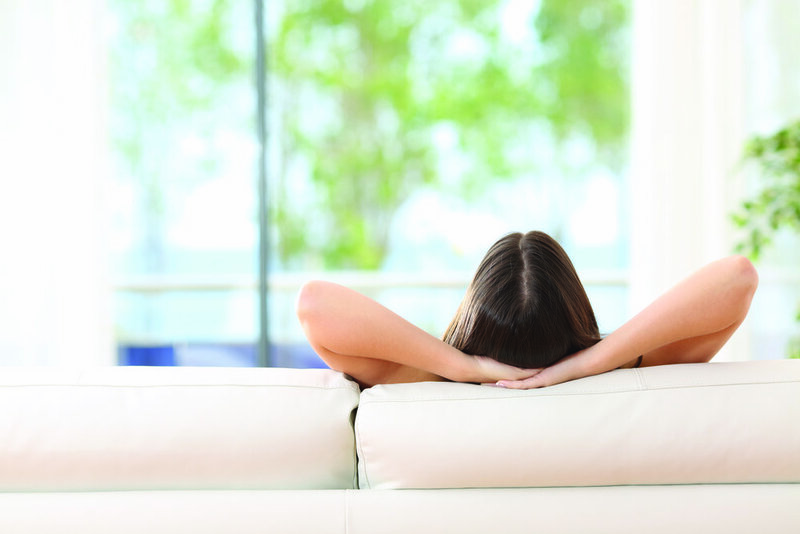 “Honestly, the only thing that occupants tell us they feel after spending time in a home equipped with a ComfoAir ventilation system is better,” quips John Rockwell, Northeast Technical Engineer for Zehnder America. “The amount of air that’s being circulated is far less than what’s typically required for heating or cooling, so occupants will never feel a draft from the ventilation system,” he says. Fresh, filtered air flows silently into each room via an inlet grill typically located lower on an interior wall. The new, cooler, drier air forces the warm, stale air to rise and exhaust itself through a second small outlet grill (typically located on an adjacent wall near the ceiling). Plus, since all the mechanics of the system are located out of sight in another part of the home—typically in the basement—hardly a sound can be heard in the room. Fresh air has long been associated with many health benefits, including increased energy, more restful sleep, reduced stress, lower blood pressure, a stronger immune system and an improved overall mood. One important point of clarification is that both HRVs and ERVs are not space-heating devices on their own. They do not create heat. They simply transfer it from one source to another while providing a constant supply of fresh, clean, filtered air. However, whole-house ventilation systems will help reduce the overall heating and cooling energy loads throughout the year by delivering fresh-filtered air that’s not too hot and not too cold—and for many Maine homeowners, that’ll feel just right. If you’re not in the market for a new home and don’t want to spend a lot of time and money installing a whole-house ventilation system, there are still many advantages to cir- culating old, stale air up and out of your house. Wes Riley, an independent home energy consultant in Brunswick, suggests that many Maine homeowners could achieve similar air transfer rates by simply upgrading their existing bathroom exhaust fans. Research from Efficiency Maine found that most existing homes in Maine already have more than 3x the airflow that’s recommended for good indoor air quality. While that may not necessarily be good news in terms of the overall energy efficiency of many Maine homes, it does mean that getting outside air into a home is pretty easy. That’s one reason why Riley and others believe that installing continuously running exhaust fans, such as the Panasonic WhisperGreen or equivalent models, is a good-enough solution for improving indoor air quality. ENERGY STAR certified, the latest technology allows these fans to run continuously while consuming very little energy. Intelligent controls on the unit automatically adjust the fan speed to match the conditions in the room. “I have never come across a situation where I felt that installing an ERV for several thousand dollars would be more effective than adding or upgrading one or two new (continuous) exhaust only fans in the bathroom,” Riley says. Bathroom exhaust fans, by creating a small pressure differential inside the home, continuously pull stale air out through the bathroom, theoretically forcing new, outside air to enter from a myriad of small—and not so small—openings throughout the home. Unlike an ERV/HRV system, the air entering the home in this manner will only be as warm or cold as the outside air temperature. Additionally, it can be difficult—if not impossible—to control or regulate exactly where and how much outside air comes into the home. Still, for some, the benefits and relative low cost of installing an exhaust-only system may ultimately outweigh any of the additional costs from having to heat or cool “new” air once it arrives inside. This article was re-printed from the fall 2017 issue of Green & Healthy Maine Homes. Subscribe today!